I'm experiencing this annoying bug, just upgraded my ps1000 to the latest firmware and it started to go offline randomly. Yesterday it happened twice while I was driving on the highway. Anyone else affected? Yes, it happened to me also and on the highway also in relatively heavy traffice. Needed to key off and on to get a restart. Same here. Actually the first event I though it was an electrical fault did no turned the key and the ecu rebooted itself in about seconds. Yesterday I discovered that the key turning and so immediately reboot solved this issue. In my case it shows up ewhen I kick all the throttle up after some seconds and very randomly. When the ECU goes 'offline', do the LEDs on the ECU go off also? Actually the way I placed the ecu in my Car it makes me Impossible to check them directly. Next time I will stop the car and go for them. HaltechMitch wrote: When the ECU goes 'offline', do the LEDs on the ECU go off also? Of no help on the LED issue. I was too busy avoiding being run over to look at for any lights. I hate to be captain obvious, but please don't drive your car in traffic if it is randomly shutting off. You should be on a dyno to diagnose problems. If you are sure it is related to firmware then please re-install the previous firmware version. Can you both attach the maps, or better yet contact us directly for faster support. Also needed will be a list of all hardware attached to the ECU. We have not seen anything that could cause random shutdown related to the firmware, and Mitch's suggestion to monitor the LEDs is to detect if the power is being cut or if something else is happening. HoSDo_earth : you initially mentioned going offline? Or are you having the ECU shut off (engine turns off)? Hi matthew! Well first of all I can tell that after contacting the technical support they suggested this failure could be related to the polyfuse. The suggestion is that some 5v device is draining too much current. In any case I thought about re-running the firmware upgrade and I will do it in a couple of days. By the way if the failure do not vanish the real trouble is shipping the ecu to wheterill park because shipping fees from Italy are ludicrous high. Ok, being the polyfuse or not I have managed to run a pair of datalogs and what makes me crazy about this issue (it's 9 months already) is that it only come in at 4110 rpms (range 4114 - 4119). Sometimes even at slow speed in short gears so it is not load related. I've also checked that all the leds are showing no fault and power led is steady. Ecu Manager shows "lost ecu connection" that's what scares me most. I jumped in above with the same trouble. I was using a variable reluctor style crank position sensor. I lowered the threshold voltage in the higher rpm cells of the table. 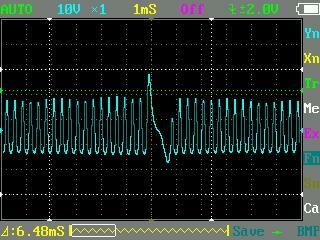 What I now understand after 2 frustrating months trying to get an Elite to sense the crank pulse while using the same sensor wheel (I.e, no hardware change), is that the lower the voltage value in that table, the greater the signal gain applied by the ECU. Different "something" is in the Elite because the P1000 setting didn't work at all. I have these set very low in the Elite and it's hanging in there. I also had to do similar lowering of the voltage on a BMW with the BMW sensor/wheel or it would just shutdown at about 2800rpm. Can we pm on this? I just didn't understand if you solved and how! Ok I've got my dso back today do I did some scoping. I can confirm this fault is rpm related cause I managed to reproduce it at each gear from 3rd to 6th on various loads but always starting at 4100 rpm. When the ecu goes crash both +12 v and +5 v from the ecu (measured from the aux trim module connector) are still up and steady. So is a the power led and no error code shown. honestly I don't believe this is a power fault, to me it looks like it is a logic fault maybe the processor goes crash for some reason.